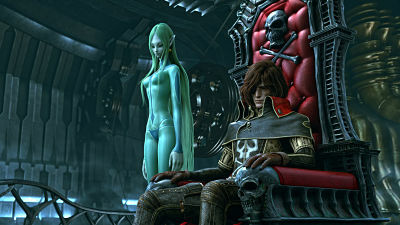 The futuristic, fatalistic epic animé adventure, Harlock: Space Pirate (2013) is an adaptation of the spectacularly popular Leiji Matsumoto saga, directed by Shinji Aramaki. The story is about an intergalactic war with Earth as the ultimate prize and the eponymous Captain Harlock as its only potential defender. Fighting against the authoritarian universal government known as the Gaia Coalition, Harlock and his loyal crew are the sole beings with a chance of defeating the Coalition and returning humanity to Earth. Twilight Time’s package includes two versions of Harlock: Space Pirate – the original Japanese version (Disc 1) and the international cut of the film (Disc 2). The two versions come in both 3D and 2D.